Great product would buy again. Bought this product for my son who swims quite often. 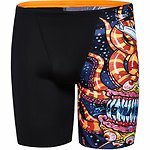 Design was cool and much loved by my son, fit was great and he said that it was comfortable to wear and made him feel faster in the water. Have returned to buy more pairs of these trunks.